Experience the best of Bangkok when you stay at ibis Styles Bangkok Khaosan Viengtai. It’s an ibis Bangkok that offers superb comfort and an exciting location in the heart of Khao san! Stay at this strategic area and be minutes away from cultural attractions as well as unique cafes and nightlife. Simply put, it’s your best choice for an economy design hotel in a buzzing neighbourhood. ibis Styles Bangkok Khaosan Viengtai offers an upbeat take on a peaceful space. It’s a Khaosan road hotel where guests can have a stay that makes it all worthwhile! Each stay includes free high-speed Wi-Fi internet, as well as access to an outdoor rainbow pool and kid’s corner. There is in-room delivery and a daily buffet breakfast at Streats Café. 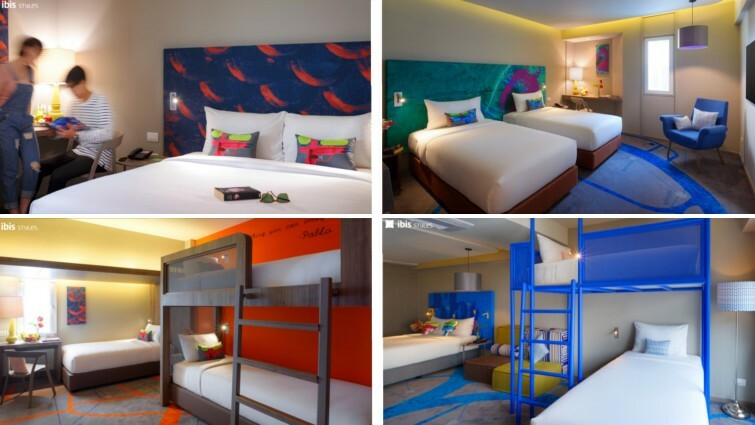 This ibis Bangkok has a room for every style of traveller. Three versatile room types provide all the amenities for your memorable stay. 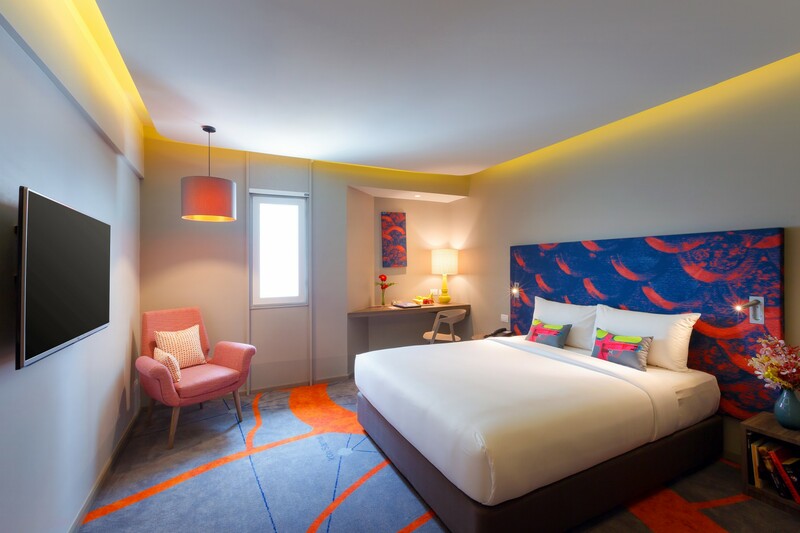 Each room boasts a renowned ibis SweetBed, all you need for sweet dreams. The crown jewel is the spacious 40 sqm family room, perfect for up to 6 adults. Friends love the triple room, which can sleep 3 adults. The standard room also presents a solid option with its choice of twin or double bed. Come as you are and leave ibis Styles Bangkok Khaosan Viengtai well-rested and refreshed! Getting around Bangkok is a breeze when you stay at ibis Styles Bangkok Khaosan Viengtai. The immediate neighbourhood charms with retro-vibes. Making your way around by foot is still possible- a rarity in Bangkok! Wander the streets and imagine the city as it was decades ago. It’s a breeze to reach key cultural landmarks like the Grand Palace, Wat Po and Wat Arun. Must-visit foodie destinations like Chinatown are a tuk-tuk or taxi ride away. You can also explore the riverside via boat! The nearest piers are walking distance from the hotel. A key attraction near this ibis Bangkok is the new IconSiam department store. If downtown’s glitzy entertainment districts beckon, it’s easy to connect to the nearest BTS or MRT station. When you need to recharge from days out, enjoy yourself right where you are. Streats aims to be more than “just” your usual hotel restaurant. It’s where the neighbourhood meets to share meals and make memories! Savour the aroma of fresh baked bread wafting out of Streats Bakery daily. Start each morning with a smile as you enjoy the buffet breakfast at Streats Café. Want to treat yourself for lunch instead? Streats’ daily lunch buffet is the best value buffet in Bangkok! Need to unwind? Streats Bar & Bistro is where you need to be. People-watch during the day, sipping on an espresso. Dine on hearty bistro fare with new takes on Thai faves. Lobster pad thai and basil burgers are delicious answers to hunger-pangs! Serious cocktails and generous beer pours add to the experience. When night falls, get ready to party! Live out your bliss to the tunes of the house band playing 6 days a week. Soi Rambuttri just comes alive at night. Become part of the crowd and you’ll experience why this area exudes such magnetism. Spend your Bangkok stay the way you want to. Go wild or get cultured. Get that spark and inspire yourself with our creative design and heartfelt service. Staying at ibis Styles Bangkok Khaosan Viengtai lets you create your best Bangkok experience. Be sure to make the most of your budget and book direct. Secure the best rate and earn points for your stay today!